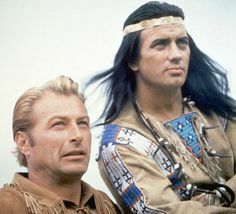 A German movie about Old Shatterhand (Lex Barker) and his friend, an Apache chief named Winnitou. The movie is the first in a series of eleven movies based on the works of best selling German writer Karl May. In this movie Winnetou and Shatterhand try to stop a gang of outlaws looking for the the legendary treasure of Silver Lake. A map, given by an Indian chief, with directions to the treasure, has been torn in half. Shatterhand is asked to help recover the map before the outlaws get it. Colonel Brinkley, who is the bad guy, and his men attack the settlers looking for the other half of the map. They are beginning to overwhelm the settlers but then Winnetou and his men show up to save the day. Next we see an Indian village where the Colonel has killed all the women and children while the men were away hunting. When the warriors return they attack Shatterhand and his men. They hold them off by shooting their horses out from under them. The Indians, who were Utes, bring Shatterhand and his men before a tribal council. The Ute village had totem poles (which you don't see too much). Shatterhand is given a chance to fight Big Wolf, hand to hand, to save his men. Tied to a pole they fight with a tomahawk and a knife while all the German actors dressed up as Indians look on. With one punch Shatterhand knocks Big wolf out, and then says he is a friend of the red man. Then they ride off. Winnetou then joins up with his Shatterhand and his men. The Utes are still pursuing Shatterhand though. When the Utes trap Wiinetou Big Wolf shows up and shoots the bad Ute chief who broke his word to let them go free. The hatchet is buried between the Utes and the Apaches. The Colonel finds the cave at Silver lake where the treasure is. Inside the cave is an old Indian who is guarding the treasure. The Colonel and his men enter and there is a pile of gold. The Colonel and his greedy men then fight each other, and then the Colonel shoots his men down. The old Indian guard then pulls on a chain which releases the gold and buries the Colonel. Interesting European look at the West and the Indians. It was interesting to see the Indians riding to the rescue instead of the cavalry. Peace pipes, totem poles, Utes, Apaches, Osages, a secret cave, a magic rifle .. lot of stuff going on.